(Land and Marine) have had a busy summer with taskings and continuous training exercises. A few close calls remind us of how quickly boaters and hikers can get into trouble and life-risking situations. We understand accidents happen; that’s why we remain on call 24/7/365. 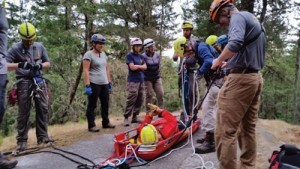 In July, Sunshine Coast Search and Rescue used the long line rescue technique and a helicopter to extract a seriously injured subject off Richardson Lake Road. (see photo) RCMSAR Station 61 in Pender Harbour was tasked during the Malaspina Regatta, when one of the participants was dismasted. The Iona C, which had earlier set the marks for the race and was on the course, was quickly alongside, and took the vessel under tow back into Pender Harbour. In mid-August, a vessel reported hitting a rock and was taking on water in Green Bay, in Agamemnon Channel. Coxswain Tommy Monnier and crew on board fired up the dewatering pump and then called Madeira Marine to have the affected vessel hauled the same day. Station 12 rescued a sailing vessel in Buccaneer Bay in 5’ swells, falling tide with an anchor challenge; a week later Station 61 was tasked to recover the same boaters’ dinghy in the Malaspina. They were quite grateful to RCMSAR having had 2 encounters with Sunshine Coast stations in the same week. Best intentions evaporate quickly in the absence of planning and having the right safety equipment in hand or on one’s body. According to the Lifesaving Society, drowning is the third leading cause of unintentional death for Canadians under the age of 60. Most deaths caused by drowning are preventable, by taking certain precautionary steps during watersports activities. About one-third of all water-related deaths occurred while boating. The majority of fatal accidents are caused by capsizing, collision or falling overboard. An Open House and Fall Recruiting Drive is planned for Monday, September 18th for all three RCMSAR Stations (Gibsons, Halfmoon Bay and Pender Harbour) at the Seaside Centre in Sechelt from 5:00 – 8:00 p.m. Both Society (administrative and fundraising) and Crew (on water) volunteers are needed. 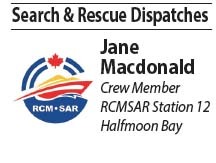 When pagers sounded on Sunday evening (July 9) at 11:22 p.m. RCM SAR Station 12 members were notified of a Code 2 (Pan Pan call for help) for our inside vessel located at Porpoise Bay. No matter the hour, a Coxswain and two crew members responded to a campsite at Nine Mile Point where two separate groups of campers requested emergency evacuation due to an aggressive cougar who was stalking them. Normally an idyllic campsite, the seasoned kayakers and experienced outdoor enthusiasts grew increasingly nervous after sunset when an agitated cougar appeared and would not retreat after several attempts to scare it away. With young children in one of the camping parties, the responsible adults called for help and elected to give nature its space. All supplies and camp materials were left for retrieval the next day due to the proximity of the angry feline, which can be a formidable hunter. The visibly shaken and nervous campers experienced difficulty contacting water taxi or animal control assistance, due to the time of night and spotty cell phone reception. A call came to Joint Rescue Coordination Centre, likely via 911 emergency call referral, which relayed the emergency location and situation to our local volunteer crew in Porpoise Bay. After boarding six adults and three children on RCM SAR’s swift response vessel and ensuring everyone had lifejackets, the crew transported the upset campers to safety for the remainder of the evening. A number of sheepish apologies for calling were offered by the campers; there is no need to ever apologize for needing help, as that is why the Royal Canadian Marine Search and Rescue exists. Saving lives on the water and helping to prevent accidents is what the crews of volunteers train for all year. The Sunshine Coast has three volunteer-staffed Marine Search and Rescue stations which respond to boater (including kayak and stand up paddleboard) emergencies 24 hours a day, 7 days per week; Station 14 in Gibsons, Station 12 in Halfmoon Bay / Porpoise Bay and Station 61 in Pender Harbour. All marine campers and boaters are encouraged to travel with a functioning VHF radio, where Channel 16 should be used to convey emergencies. If coverage is available, distressed boaters can call *16 on mobile phones to call for help. RCM-SAR will respond, no matter the hour or situation without judgment or penalty; it is what we do. Meet Erin Heeney, June’s Crew Member of the month! Erin has been an RCMSAR 12 member for 1.8 years. In this short time, she has gained 557 total hours of volunteer service, which includes 117 hours of sea time. In the fall, Erin attended and was successful at SARNAV 1 and also received her SVOP (Small Vessel Operator Proficiency) certification. She has also completed her MED A3, Flood and Swiftwater Awareness Course and is a certified Pleasure Craft Safety Checker. This past year, Erin was a co training officer for Station 12 – ensuring that training was top notch, covering all of the lessons to assist new crew to get out on the water and become the best they can be! Erin’s hard work, dedication, bubbly attitude, knowledge of SAR operations and boat handling skills has paid off – she will be heading to RHIOT (Rigid Hull Inflatable Operator Training) school in February in Bamfield, ready to crush it, as she always does! Bravo Zulu, Erin! When a 40-foot powerboat began sinking on June 4, a sunny Sunday afternoon, seven people were rescued off the North side of Keats Island, Howe Sound. RCMSAR Station 14 Gibsons and Station 1 West Vancouver, along with a Canadian Coast Guard vessel and crew from Kitsilano Base, were tasked by Joint Rescue Coordination Centre (JRCC) Victoria. With the additional help of a vessel of opportunity, all SAR teams worked closely together to ensure everyone made it safely home, and the boat got towed. Calls for help on the water go to JRCC Victoria which coordinates and directs Search and Rescue Units (SRUs) within its area of responsibility. The centre serves as a communications hub and primary point of contact for the coordination and direction of rescue units and on-scene commanders in order to fulfill the mission in the safest and most effective manner possible. Please remember to dial *16, #727 or call 1-800-567-5111 to report a marine emergency. The Sunshine Coast has three volunteer-staffed Marine Search and Rescue stations which respond to boater emergencies; Station 14 in Gibsons, Station 12 in Halfmoon Bay / Porpoise Bay and Station 61 in Pender Harbour. To honour Canada’s 150th, RCMSAR crew will be escorting paddlers on July 1 as they traverse the length of Sechelt Inlet. On land, Sunshine Coast Search and Rescue (SC SAR) is preparing for their AGM and reflecting on the past year’s 16 tasks involving 20 people in a variety of settings. A recent example was a task to assist at a motor vehicle accident where it was suspected the driver was missing; fortunately the driver was located. As we enter into peak season for enjoying the outdoors, SC SAR wishes to remind people of some basic safety precautions. Before heading in to the back country, leave a trip plan with someone, take ample food and water, bring a functioning, fully charged communication device and make sure you have proper gear, including first aid supplies. Both Sunshine Coast Search and Rescue and Royal Canadian Marine Search and Rescue will be implementing new membership recruiting drives this September with training starting the first week of October. In late June a volunteer application form will be posted on the website at sunshinecoastsar.ca or visit rcmsar12.org for details. Meet Janis Franklin, May’s Crew Member of the month! Janis has been an RCMSAR 12 member for 2.5 years! In that time, she’s gained almost 400 hours total volunteer time, which includes 134 hours of sea time and has been on 10 SAR missions. Janis is a dedicated member of our station and always goes above and beyond to ensure that any task completed is done well and with a huge smile! She also is our resident photographer, always making us look our best! Thanks for everything that you do Janis, Bravo Zulu! It is May 2017. Spring is upon us. For many of us, thoughts now turn to the upcoming boating season. This means cleanup of the boat, de-grunge the slippery decks, air out the inside, change the engine oil and filters, and general maintenance of the boat and equipment. Next, maybe, a haul-out to clean and paint the bottom, replace the zincs, and check the props. This a good time of year for these rituals. It is also a good time to check the safety gear, such as the life-jackets, fire extinguishers, flares, running lights, bilge pumps, anchors, radios and all the other important safety equipment, and to review the response procedures with your family and crew members. A basic reference document is Transport Canada’s “Safe Boating Guide”. It is available on line at www.boatingsafety.gc.ca . RCM SAR Station 12 provides search and rescue capability to the central Sunshine Coast with our two boats – one in Secret Cove and one in Porpoise Bay. In addition, and in the interest of safe boating, we also provide a complimentary safety check service. We have eight members of Station 12 who are trained to carry out safety checks on pleasure boats up to 24 metres in length. It is roughly a 40-point check list. It is free and entirely voluntary. A safety check takes about an hour. The result of a safety check is a written report to you, the owner. The RCM SAR report looks a lot like the 50-point safety check on your car when you have it serviced, with all the mandatory requirements checked (Yes or No) and recommendations for corrections or improvements. Boats that check Yes for all the requirements also receive a sticker that demonstrates compliance. Why is this important? 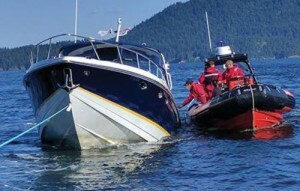 First, recreational boats in BC are required by law to meet certain safety requirements. Owners of boats can be fined by the law enforcement agencies (RCMP, Coast Guard, Transport Canada, etc) if the boat is not in compliance. Second, concerns your boat insurance. While insurers may not actually give a discount in premiums for boats certified to meet mandatory safety requirements, they do look favourably on those owners who have the up to date safety check. It is also reassuring for the owner to know that if you did have an accident and a claim, a record of a passed safety check could be important. Third, is your own peace of mind. Boating in BC waters, for most of the time is pretty benign. But weather can turn bad, fast, and mechanical problems can arise unexpectedly. It is good to know that you have covered the bases to protect your boat, your family and friends boating with you. How can you arrange for a RCM SAR safety check? Join us at Secret Cove Marina on Sunday, June 4, 9am-2pm for a private Pleasure Craft Safety Check. Please phone 605-885-7456 to book an appointment or email us at info@rcmsar12.org.